Smartsave is a market leader in providing great savings to the consumer at thousands of participating worldwide attractions and restaurants. The discounts are offered through a variety of distribution channels including our website www.smartsave.com, maps (London for Less and New York for Less) and mobile apps. 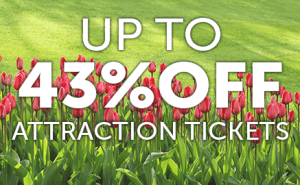 By using Smartsave vouchers, families and individuals can save 20% off entry tickets at top attractions and on the total food and drinks bill for up to 6 people at any of the participating merchant partners in the UK, USA, France, Germany and the Netherlands. Interested in becoming a Smartsave partner? There is no upfront fee for partners to join the Smartsave programme. We offer direct marketing opportunities through a variety of channels to promote partner products. From dedicated promotional pages on our website which reaches over 2 million annual users, to monthly newsletters, social media engagement through Facebook, Twitter and Instagram, blogging and competitions, listings and advertising on our map and app, there are numerous opportunities to attract additional visitors with Smartsave. More about Metropolis International Group Ltd.